My mother believed that Nina was born in Hannibal, MO, but based on the location of her parents' marriage (1877 in Chillicothe) and their location in the 1880 Census (in Chillicothe), Nina was more likely born in Chillicothe. I suspect the source of Nina's birthplace being Hannibal is that we have a family legend of being related to Mark TWAIN, and that led to the belief that Nina was born in Hannibal. So far, the evidence doesn't support either. 1909 CA: Stanislaus Co.: Turlock birth of daughter, Shirley D.
1. First-hand knowledge of Diana Gale MATTHIESEN. Albert Roy "Bert" & Nina (WILLIS) STRAUB were my maternal grandparents, well known to me in life and dearly loved. I am immensly proud of my grandparents. They managed to raise eight children (all decent, honest, hard-working citizens) through the years of World War I and the Great Depression, even though both were severely handicapped. My grandmother had one leg shorter than the other due to having had polio as a girl, compounded by crippling rheumatoid arthritis as an adult. My grandfather took four bullets in the head and neck during the Phillipine Insurrection, which left him with one glass eye and an arm and leg paralyzed on one side. Yet, he supported his family by driving a rural mail route in a Model-T Ford (and if you've ever seen what it takes to drive a Model-T, you know what a feat it was for a man with only one good arm and leg to do so). 2. Interviews of my mother, Nina Gale (STRAUB) MATTHIESEN, subjects' daughter. It is oral family history/legend/myth that Bert and Nina arrived in San Francisco in the aftermath of the Great Earthquake of 1906. They are said to have sold waffles to the victims from a push cart. We do know, for certain, that they were still in Nevada as late as 13 Jan 1906 and were in Turlock, CA, by 4 Jan 1907 for the birth of my mother. A.R. Straub and Mrs. Nina Dean were united in marriage at the Churchill Hotel parlors Wednesday evening, Rev. G.W. Black performing the ceremony. The bride is the daughter of Mr. and Mrs. Willis of Soda Lake and is a beautiful and accomplished lady. The groom is one of the young men who has lately cast his lot in the section and has a choice homestead in the same locality. The Standard joins in extending Congratulations. My grandmother was, indeed, beautiful; she was also a voracious reader and an accomplished pianist — on an ornate rosewood Steinway, now in the possession of one of her granddaughters. 5b. 1900 Census Every-Name-Index/Images (online at Ancestry.com): Nina (WILLIS) DEAN (æ 20, b. Dec 1879, MO) and her daughter [Lucy] Emma DEAN (æ 1, b. Feb 1899, MO) are living in Burr Oak Twp., Lincoln Co., MO, with Nina's parents (q.v.). Though divorced, Nina declares herself a widow, which is not unusual for the time when being divorced held a severe social stigma. 6b. 1910 U.S.A. Census Every-Name-Index/Images (online at Ancestry.com): can't find Nina and the children, and I really looked. "Monterey Road" is the Monterey Highway (U.S. 101), also known as "El Camino Real" (the King's Highway), built to connect the chain of Catholic missions and military presidios established by Spain in California between 1769 and 1823 — each mission and presidio intended to be no more than a day's ride from the next. Bert was the Postmaster of the little town of Coyote, which has since been engulfed by the southerly growth of San Jose. In 1974, the Coyote Post Office building was relocated to the San Jose Historical Museum in San Jose. The enumerator didn't take down streets or street numbers for anyone. Bert is living alone (i.e., not in a hotel or boarding house). Column 31 was hard to read; I think it says "PW," which would stand for "Philippine War," which would be correct. Based on my first-hand knowledge, from the 1940s until their deaths, Bert & Nina were living together, first at 1295 Blewett Ave., San Jose, CA, then, by 1945, at 2337 Moorpark Ave., San Jose, CA. 11. Certificate of Death: Albert Roy Straub, Registered 8 Jul 1969, State of California, County of Santa Clara, San Jose, California, Local Reg. Dist. No. 4300, Certificate No. 03407 5/6; informant: Mrs. Gale Matthiesen [d/o deceased]. Death: 6 Jul 1969, Serra Medical Hospital, 455 O'Connor Dr., San Jose, Santa Clara Co., CA. Bert died on 6 Jul 1969, not the 15th. His "Last Residence" was the Serra Medical Hospital in San Jose, CA, where he had lived for nearly a year before he died there. The Saratoga address is my mother's; she was handling his finances and receiving his Social Security checks towards the end. 13. Obituary: "Spanish-American Vet Albert Straub Dies," dated 8 Jul 1969, San Jose Mercury, p. 20. A. R. Straub of Soda Lake was in Fallon the first of the week. He says that activity is general in his neighborhood among the many homesteaders and that new houses are going up on all sides. He expects to get about 40 acres under cultivation this year. 15. 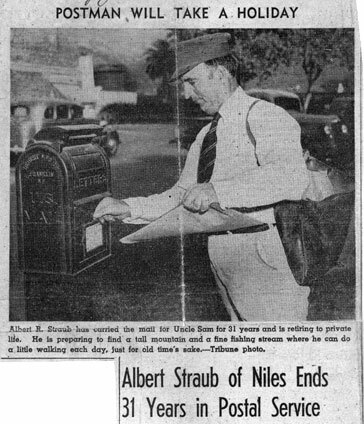 "Albert Straub of Niles Ends 31 Years in Postal Service," Oakland Tribune, 3 Dec 1939. NILES, Dec. 2.--Completing more than 30 years of service with Uncle Sam's postal department, Albert R. Straub, 60, of Niles will retire on December 15. Straub says he is looking for a "tall mountain wih plenty of trees and a deep stream with plenty of fish," indicating that he will take the proverbial postman's holiday with a little additional hiking. Perhaps it is still a touch of the wanderlust that has carried him into many States and into foreign countries throughout a colorful career which made him a soldier in two wars by the time he was 20 and left him with a half dozen medals, one from President McKinley, four bullet holes and loss of sight in one eye. Physical checkup by Government doctors recently, however, in view of the approaching retirement, found him "sound as a dollar," according to Straub, who lives on Second Street with Mrs. Straub and their daughter, Barbara. The eight children born to the couple are all living, several of whom are also employed by Uncle Sam. Straub was born at Marion Ohio, on March 7, 1879. He came to California in 1897 en route to the Klondike gold fields, but boats delayed by Winter in the Northern waters caused him to enlist with the First Washington Volunteers in 1898 for the Spanish-American War. Upon the retirement of the late Mark Crane, first rural carrier for Niles, who had held the position 27 years, Straub in 1928 took over the R.F.D. route from which he is retiring on December 15. Children of Mr. and Mrs. Straub are Mrs. Lucy Dreischmeyer of Santa Clara, wife of Clarence Dreischmeyer, State food inspector; Mrs. Gale Elliott in the soil conservation office at Watsonville; Mrs. Janet McGraw of San Jose, Mrs. Shirley Waugh of Portland, William A. Straub of San Jose, Ellis Straub, nurse in the United States Government Hospital at Panama; Barbara Straub of Niles and Steve Straub, student at the Boeing Air School at Oakland. Although the photograph shows my grandfather carrying a mail pouch, as if he walked a suburban mail route, he actually drove a rural mail route, as indicated in the article (the "R.F.D. route"). His physical handicaps (from war injuries) would have made walking a mail route impossible, so I presume the photo was staged. His left arm and hand were paralyzed and "frozen" in the position you see them, hence the claw-like grip on the envelope, which would have had to have been wedged between his fingers using his right hand. He walked with difficulty using a cane. It has come to my attention that on account of your health you have found it necessary to retire from the position of rural carrier at Niles. I congratulate you upon the length of your tenure of position as an employee in the postal service and desire to extend to you my personal wish for your speedy recovery. I am enclosing an autographed photograph in the thought that you may desire to have it as a memento. Very truly yours, James A. Harley (s), Postmaster General. In April 1862, the Burnett Post Office was established inside the 12 Mile House, which was a store, hotel and blacksmith shop. This building was destroyed by fire in 1963; but long before that, the post office was moved and a new, small structure was built by Fiacro C. Fisher, Postmaster, in 1907, next door to the 12 Mile House. There, the Coyote Post Office operated without a break until 1974, even though in 1935 Washington, D.C., had forgotten where it was and had to be told. In 1974, the building built by Fiacro was moved to the San Jose Historical Museum in San Jose. Fiacro C. FISHER was the father of Laura Estella FISHER, who married our subject's brother, William Barton STRAUB. This record was not entirely readable or intelligible, but it seems to be listing Coyote Postmasters, chronologically. Chester FISHER is Fiacro's son, who became Postmaster after Fiacro died. Lived Here Six or Seven Years Ago with a Sister and Attended School -- Went Out to Seattle Where He Enlisted in Company D, First Washington Volunteers and Goes to Manila. In the list of casualties in the Philippines published in Friday's Star, was the name of Albert R. Straub, private of company D, First Washington volunteers, who was severely wounded in the face. Young Straub was formerly a resident of this city. He lived here about six or seven years ago with his sister, Miss Gail Straub, now Mrs. Benedict of Waldo, and attended school. About five years ago he left his home near Waldo and went to Seattle, Wash., where he lived until last spring, when he enlisted in the army. How badly Straub is injured is not known here, as nothing has been heard except through the newspaper reports. Miss Josie Straub, who resides on Vine street, is a sister of the wounded boy and G. Straub is his father. Young Straub is only about eighteen years old. His friends here will all hope that the wound will not prove serious. This is a long article, including a full figure photo of Bert in uniform. The page image is very poor quality and the text is largely unreadable. I'll have to see if I can't track down a better microfilm. 21. Albert R. Straub. Report No. 3323 and Report No. 3505 from the U.S. House of Representatives giving Albert R. Straub in increase in his pension in January 1905. There was obviously a preceding house bill (H.R. 13377), and I'm currently trying to obtain a copy. Timetable for Albert Roy "Bert" STRAUB in the Spanish-American War and Philippine Insurrection and surrounding years. Update (27 Sep 2013): I just found some photos Bert took when he was in Manila. None of him, unfortunately. 1898 Feb 15 U.S.S. Maine explodes in Havana Harbor. May 6-13 The 1st Regiment, Washington Volunteer Infantry (WVI) is formed in Tacoma, WA. Jun 21 Albert Roy STRAUB enlists as Private, Co. D., 1st WVI, Seattle, WA. Jul 1 Teddy Roosevelt and his Rough Riders take Kettle Hill [not San Juan Hill], San Juan Heights, Cuba. Jul 25 General Wesley Merritt, commander of Eighth Corps, U.S. Expeditionary Force, arrives in the Philippine Islands. Aug 12 Peace protocol ending hostilities between Spain and the United States is signed in Washington, DC. 1899 Jan 1 Emilio Aguinaldo is declared President of the new Philippine Republic. The U.S. refuses to recognize the new government. Feb 4 The Philippine Republic declares war against the United States forces in the Philippine Islands. Feb 4-5 WVI is involved in its first combat. May 19 WVI sees action at Taguig. Jun 4-5 WVI sees action at Taitai Cainta and Morong. Jul 26-27 WVI sees action near Calamba. Sep 11 Albert Roy STRAUB receives an Honorable Discharge. Oct 6 Albert Roy STRAUB is back in Waldo, OH. Oct 9 WVI arrives in San Francisco, is stationed at the Presidio. Nov 1 WVI is disbanded. 1900 Jun 4 Albert Roy STRAUB is home in Waldo, OH, for the 1900 U.S. Census. 1902 Jul War ends in the Philippines, with more than 4200 U.S. soldiers; 20,000 Filipino soldiers; and 200,000 Filipino civilians dead. 1905 Feb 25 Albert Roy STRAUB is awarded an Invalid Pension of $30/mo by the Bureau of Pensions, U.S. Dept. of the Interior. Dec 27 Albert Roy STRAUB marries Mrs. Nina (WILLIS) DEAN in Fallon, Churchill Co., NV. 1906 Apr Albert and Nina (WILLIS) STRAUB arrive in San Francisco just days after the Great Earthquake [family oral tradition, may not be true]. Jun 9 Albert R. Straub, Co. D, 1st Washington Infantry Volunteers, is awarded a Bronze Medal for service in the Philippines.